Earlier this year, town meetings across Vermont asked citizens if impeachment proceedings should be initiated against the president and vice president. Thirty-seven towns voted yes, and the Senate approved a resolution calling for impeachment. Now a statewide poll conducted by CBS affiliate WCAX in Burlington, Vt. posed the question to 400 likely voters. 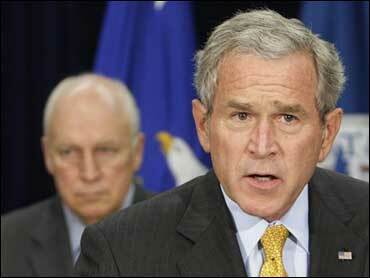 Sixty-one percent said they would be in favor of Congress beginning impeachment proceedings against President Bush. Thirty-three percent opposed it, and 6% were not sure. The numbers for Vice President Cheney differed only slightly: Sixty-four percent favored impeachment, while 31% opposed it. Seventy-five percent of respondents said they categorized the president's performance as "fair" or "poor." "I'm really overjoyed by this," said Jimmy Leas, a South Burlington lawyer who has been a vocal advocate of impeachment. He told WCAX correspondent Kate Duffy that the poll shows "here in Vermont, nearly two-thirds of the public understand we have a serious problem, and the way to address this is to remove the officials who are usurping power." "The impeachment results are somewhat surprising, frankly, to me," Middlebury College professor and columnist Eric Davis said. He said the numbers are a sign that Vermonters are extremely dissatisfied with the administration. "Even though their terms are ending in a little bit more than a year, a majority of Vermonters don't want to even see them remaining in office until January 20, 2009." Vermont's legislature took up the impeachment issue last spring. The Senate passed a resolution calling for the president's impeachment, but a similar effort failed in the House. Constitutionally, only Congress can impeach an executive, yet it could be spurred to do so by a state legislature, or by the motion of a single representative. According to the Jefferson Manual, if a House member introduces impeachment as a question of privilege, it would supersede all other business before the Congress and must be addressed. Peter Welch, D-Vt., the state's sole Representative, has said he does not support the impeachment of Mr. Bush or Cheney. Speaking at a town hall meeting on the issue in May, he argued impeachment would be a distraction and hamper efforts by some in Congress to end the Iraq war. Since then, the number of U.S. troops in Iraq has increased. During this week's Democratic debate in Philadelphia, Rep. Dennis Kucinich, D-Ohio, repeatedly called for articles of impeachment to be pushed forward. "I think that our democracy is in peril, and unless the Democrats and the Congress stand up for the Constitution, we are going to lose our country." Leas said the effort isn't over. "The founding fathers decided we could have a Congress that's just as corrupt as the president and it's up to the people to get involved and take action," he said. "And this poll shows that the people understand this - [and] they don't like the direction this country is going." Impeachment of chief executives is rare: Congress has impeached only two presidents in the country's 231-year history - Andrew Johnson in 1868, and Bill Clinton in 1998. Both were acquitted by the Senate. Richard Nixon resigned from office before the House was to take up an impeachment vote against him in 1974. "Would you favor or oppose Congress beginning impeachment proceedings against President Bush?" The poll was conducted for WCAX by Research 2000, October 17-19.